After refining his ideas about species change in the special case of barnacles, in 1859 Charles Darwin published a general account of his theory of descent with modification by means of natural selection. Contemporaries referred to the origin of species as that “mystery of mysteries.” Darwin appreciated the complex relations of any species with its environment, and clarified how it is that some varieties have greater success than others in leaving offspring. Varying conditions of life cause organisms with particular variations to survive — this is natural selection. in the Darwin@the Library exhibit. 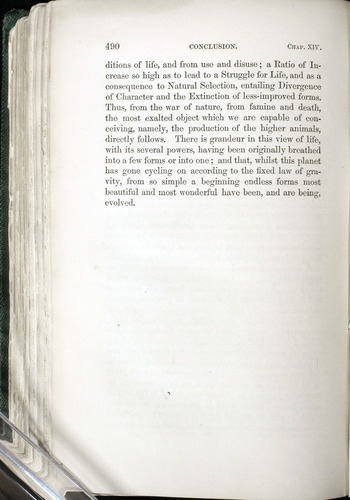 If you have an old copy of the Origin of Species, turn to page 20 and count down to the 11th line. If “speceies” is misspelled, then you have a first edition. In the first chapter, Darwin demonstrated the vast extent of variation among domesticated species. As a result of human selection in breeding, dogs and pigeons and other animals have undergone remarkable changes. As it was elsewhere elaborated: The humble bee pollinates the most desirable variety of clover, but because the bee builds its nests on the ground, a certain species of field mouse destroys the humble bee’s nests. The clover is used to make the best quality hay, which is used to feed the best horses of the British cavalry. The British cavalry enforces British power in the colonies. Because cats eat mice, and old ladies keep cats, the continuance of the British empire therefore obviously depends upon a bountiful supply of old ladies! 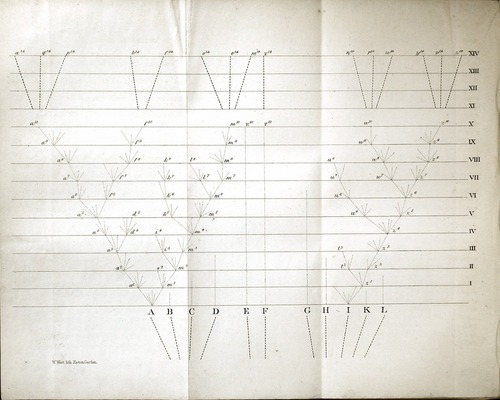 Darwin’s theory of evolution was expressed most clearly in a foldout diagram which illustrates a pattern of “branching divergence,” as species change by descent with modification from common ancestors. Darwin marshaled evidence from geology and geography showing that species appear, both geographically and in the fossil record, in patterns consistent with their descent by modification from common ancestors. Curiously, the very last word of the book is the only place in the entire work where the word evolution appears in any form.